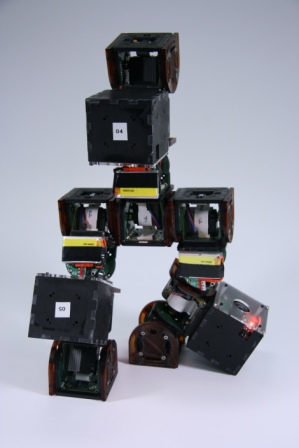 CkBot is a self assembling robot, developed by Professor Mark Yim at University of Pennsylvania. The report aimed at shaping this technology-driven discovery into a customer-driven product, identify the target market for the product & developing a marketing strategy for penetrating the market. It also aims at providing an assessment of the total market potential to develop a dollar sales forecast over time for the product. What is a Modular Robot? Modular self-reconfigurable robot systems, sometimes called metamorphic, can also reconfigure (re-arrange) their own modules. This increases the versatility of the system. For example, the robot may use a fast gait like a rolling track (Fig.2) or it could use a snake-like gait (Fig. 3) to crawl or configure into a support structure (Fig. 4). Other applications for these robots include those that require this high versatility where the optimal shape is unknown. There are three key motivations for designing modular self-reconfigurable robotic systems. Versatility: Self-reconfigurable robotic systems are potentially more adaptive than conventional systems. The ability to reconfigure allows a robot or a cluster of robots to disassemble and reassemble machines to form new morphologies that are better suited for new tasks, such as changing from a legged robot to a snake robot and then to a rolling robot. Robustness: Since robot parts are interchangeable (within a robot and between different robots), machines can also replace faulty parts autonomously, leading to self-repair. Low Cost: Self-reconfigurable robotic systems can potentially lower overall robot cost by making many copies of one (or relatively few) type of modules so economies of scale and mass production come into play. Also, a range of complex machines can be made from one set of modules, saving costs through reuse and interchangeability of the system. These three advantages have not yet been fully realized. The added degrees of freedom (DOF) make modular robots more versatile in their potential capabilities, but also incur a performance tradeoff and increased mechanical and computational complexities. A modular robot is likely to be inferior in performance to any single custom robot tailored for a specific task. Consequently, the advantage of modular robotics is only apparent when considering multiple tasks that would normally require a set of different fixed-morphology robots, or when the nature of tasks cannot by fully determined before the robots are deployed. The primary idea for building a Modular robotic system to replace multiple single task custom robots was developed by Dr. Mark Yim during his research as a PhD candidate at the Robotics Lab of Stanford University in the year 1993-94. The initial model known as the Polypod was made up of two types of modules: Segment – a 2-DOF 10-bar linkage with 2 connection ports and Node – a rigid cube-shaped housing for batteries with 6 connection ports, one on each face of the cube. Segments were attached end-to-end to form a snake-like leg. 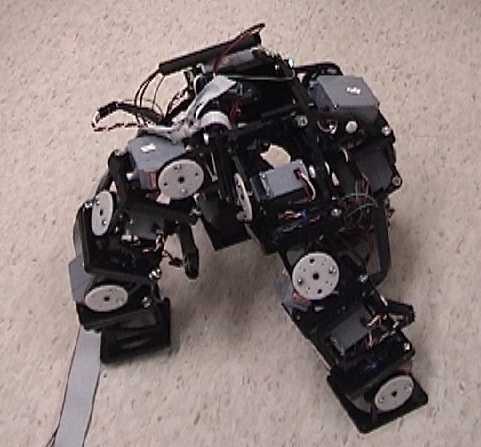 Multiple legs can be attached to nodes to form a many-legged robot. This modularity allows dynamic self-reconfigurability. After graduating from Stanford University, Dr. Mark Yim continued his research on Modular Robots at Palo Alto Research Center (PARC), formerly known as Xerox PARC. He developed the three generations of the modular robot ‘PolyBot’. PolyBot is a chain self-reconfiguration system. Each module is roughly cubic shaped, about 50 mm on a side, and has one rotational degree of freedom (DOF). It is part of the PolyBot modular robot family that has demonstrated many modes of locomotion including: walking biped, walking with 14 legs, slinky-like (end over end), concertina in a gopher hole, inchworm gaits, rectilinear undulation, and side-winding gaits; rolling like a tread at up to 1.6 m/s; riding a tricycle; and climbing: stairs, poles, pipes, ramps, etc. The modules have brushless flat motors with harmonic drive transmission, force torque sensors, whisker touch sensors, and infrared proximity sensors. They use hermaphroditic connectors with shape memory alloy actuated latches. Dr. Mark Yim accepted the position of Professor in the Mechanical Engineering department at the University of Pennsylvania. He continued his research on modular robots and developed another platform known as ‘CkBot’. It is a reconfigurable modular robot that is able to reassemble itself after being broken apart – the Self-Assembly after Explosion problem. The idea behind CkBot is to have a system that puts itself back together again after it has been exploded into lots of pieces. The current version of CkBot consists of several modules mated together and programmed either in master/slave or peer-to-peer configurations. 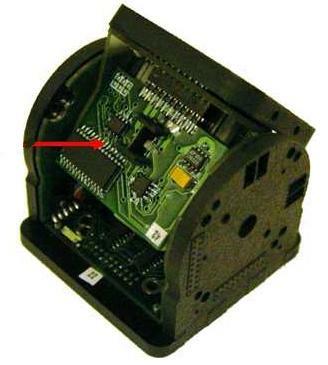 Each individual module consists of a computer brain and a servo motor (the Joint). When they come together, they start to form larger robots that talk to each other via an infrared port. When a series of modules is attached, the actuation of different modules at different times and positions allow CkBot to move in many different orientations. Given proper sensor modules, CkBot has the ability to find other clusters and reassemble itself. The research is at its prime, where new methods for holding the modules together are being developed. Various configurations like magnets, pin head meshing and clip on type hooks are being used for attaching the modules together. Some research and implementations are being made to reduce size of each module (currently a cube of approximately 60mm) and to make it more robust and versatile. The modular robot on its own cannot be used for multiple purposes. It requires various tools and sensor attachments for specific tasks. Current developments are made to divide the modular robots in cluster of four modules each, which are capable of search and reconfiguration in case of explosion. One of such cluster is as shown in fig 9. In this cluster the top module consists of a camera and light to search other such clusters and also help them detect it. The research work carried out lead to the various fields where CkBot could find it application. The analysis showed toy industry as potential markets. Further conjoint analysis and team survey lead to a decision of concentrating on toy market targeting an age group of 7 years onwards to adults. Due to wide deviation in age group three different product categories were decided. The first one being a pre-programmed remote controlled multi-mode Modular robot which can change from one configuration to another with a press of a key. This product was considered with respect to an age group of 7 to 14 year old. The other category and stage two and three of the product was a programmable modular robot set with multiple enhancement tools and mechanisms. This category can be further sub-divided into two categories depending upon the programming technique used. The toy was named at Robotron which is analogous to electron. The idea behind the name is the analogy that Atom is made of Electrons and a Robot is made of Robotron. Basic version of the product consists of a pre-configured cluster of CkBot (Robotron) modules. The basic version can transform into four basic shapes : Truck, Humanoid, Snake and Humanoid on wheel. The robot will be controlled by a remote control and can transform from one shape to another by a press of a button. The remote control will consists of 8 basic function keys, four keys for selecting the shape of robot and the other four key are multifunction depending on the shape of the robot. The basic idea for developing this version is to bring forth a basic version of Modular robot based on the theme of famous movie ‘Transformers’. Another advantage of this product will be its ease of use and low cost. The Robotron Pro is a programmable modular robot kit with additional flexibility to attach additional sensors and tools. The main advantage of the modular robot is that it can be upgraded from basic version to advanced version by addition of few attachments and programming tools. Another key advantage is the easy of programming. The programming of the robot is done with the position memorizing technique by press of a button patented by Dr. Mark Yim. Thus the intermediate version of Robotron can also be used by various age groups to not only make robot but develop various other automated systems by attaching additional modules. The advanced version aims at the adult age group. The Robotron Pro 2 is more of a research platform and caters to educational and hobbyist market rather than traditional toy market. Again the Pro 2 version can be upgraded from the basic and Pro with purchase of additional programming tools and high end sensors and tool attachments. The Pro 2 version will be a PC programmable version with the flexibility of the either of the methods. For the Pro 2 version it will be required to develop software interface for easy of programming. The Pro 2 will be best suitable as a lab or development platform for learning and adapting to Modular robotics. The world traditional toy market (not including video game, hardware and software) is $75.1 billion in 2008. It has increased 8.3% from 2007. In northern America, the market size of traditional toy market in 2008 is $23.8 billion, increasing only 1.1 % from 2007. From 2006 to 2007, the traditional toy market in northern America even decreased 1 %. (See Appendix 1, 2) This data suggest that traditional toy market in northern America is slowly increasing or even decreasing in recent three years. In the activity/construction toy market, the robotic toy is undoubtedly the emerging segment that attracts more attention. According to the report (Ref #1), there is a great potential for robotic toy market that are used for education and entertainment. At present, Robots used in education and entertainment such as Robotis Bioloid can provide modular motion and remote sensor system. And the educational kits are designed for pure fun and for educational competitions that allow students put together modules in innovative ways to create their designs. People are able to organize their robots in a creative manner such as singing, dancing and fighting. Educational robots are believed to stimulate innovation of children. Furthermore, creativity is set to be stimulated by the modular systems that are available to students in the robotic community. The biggest advantage of the modularity of robot kits is to make them versatile and flexible, and this feature is also what our products offer. Modules can be put together in a variety of ways, giving users choices about what functionality the robot will have. Educational robots can be used by every level of student. Different kits are geared to various age and skill levels. And robotics competitions are being held for every age level. Students do not yet receive formal education on robots and are more likely to enter competitions as clubs competing against each other representing different educational institutions. According to the report (Ref #1), markets for educational robotic kits at 541,000 units in 2007 are anticipated to reach 35.8 million units by 2014. As the price comes down due to the lower cost of chip and schools begin to institutionalize robotics programs, there is very fast growth anticipated. Growth at the low end robotic kits starts to level off as demand increases for robots with more components and more functionality. Markets for educational robotic kits at $27.5 million in 2007 are anticipated to reach $1.69 billion by 2014. Robot entertainment and educational markets at $184.9 million in 2007 are anticipated to reach $2.985 billion by 2014. Market growth is spurred by the evolution of a new technology useful in a range of industry segments. The educational and entertainment robots represent a first step in the evolution of the robotic markets because they provide the teaching aspect of the market that precedes any other market evolution in the services and mobility segments of consumer robotics. According to the report from RobotShop ( Ref #11) , the world’s leading source for domestic and professional robot technology, there are three kinds of educational and entertainment robotic toy kits on the current market: beginner, intermediate, and advanced kits. Beginner are especially made for those who are still new to robotics; intermediate robot kits are principally made for the robot hobbyist who has intermediate knowledge in robotics; advanced robots kits are employ more complicated designs and structures and require more knowledge of robotics like humanoid robotic toys. Our product will be sold at three different stages that cover each of these three different educational and entertainment toy kits accordingly. The calculation of market potential for our product is in Appendix 5. The target early adopters market for Robotron would be middle aged consumers with a moderate disposable income. They would have an appreciation of high technology robotic systems that can be programmed via a Graphic User Interface (GUI). These characteristics are very similar to the early adopters examined in the Palm Computing case studied in ESE 545, particularly because this specific demographic values high technology as an entertainment stimulus. This segment will continue to embrace refined modular, robotic systems that respond to environmental stimuli. The needs of this demographic are multifold: an intellectual challenge and a creativity outlet. Product expectations with the early adopters would be a lot of interest in the Stage III level of Robotron. Because of its open-source type programming and comprehensive module and sensor count, it would appeal to those in the market segment looking for a technological challenge. Additionally, the modular arrangement of Robotron allows for users to create a wide variety of robotic “creatures”, not exclusively humanoid robots. Products currently catering to the same market segment include Bioloid, a modular robot that is easily assembled. Each module is a one degree of freedom servo motor. These motors are configured only in master-slave configuration, driven by a central processor module. 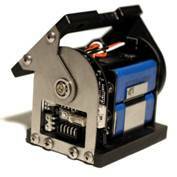 It has simple programming software that allows the user to define a specific position for all the servo motors. Basically, the motion system is based on stop-motion style commands, where the servos interpolate between user-defined poses. Additionally, the system comes with sound and optical sensors that can be used to analyze Bioloid’s environment. If these sensors are triggered, the robot will perform the predetermined correction maneuver. For example, if the sensors detect an obstacle directly ahead of it, a predetermined maneuver could be to turn left. The programming for the Bioloid robot is very simple, and very graphical. Basically, if one can operate a computer, one could program Bioloid to perform a multitude of tasks. The GUI is very intuitive and robot assembly is instructed via manual. The Bioloid robot system also sells in a three tiered fashion: Beginner Kit, Comprehensive Kit, and Expert Kit. Each additional kit increases in complexity (just as Robotron does). The price for each respective kit is $339.00, $869.00, and $2,999.00. Bioloid is only available online and is not stocked in any standard toy stores. It markets itself as an “Edutainment” robot system. These are very similar characteristics that are shared by Robotron and Robotron will leverage the existing market segment infrastructure to push product out more aggressively. The defining characteristic between Robotron and Bioloid is the software driving CPUs and the module software configuration. The Robotron modules have peer-to-peer capability, not just master slave. Fitted with the proper sensors and accompanying modules, every module has the potential to act as a central processing unit. This releases Robotron from requiring an additional control module because every module can be configured to be a control module. This feature allows Robotron to have multiple control modules in a single cluster formation. This amplifies the computing power capability in single clusters. Maintaining high build quality will affect the sale of this product. Because of the mechanical use of robots in very dynamic environments, and 90% of the components on a system will be the same, reliability failure will result in complete failure of the product line. Price of the product would also be instrumental in determining the value added by Robotron to the consumer. The early adopters phase will not use mass media to generate interest for the product. Instead, the in-house engineering team will use Robotron in the RoboGames robot competition to generate organic interest in this specific line of robot products. The refined, manufactured robot system will be noticed first by enthusiasts of robot builders. Current robotics competitions like ROBO-ONE’s entrants typically are custom designs, but have often been based in part on commercially available kits, all available for purchase on the Internet. Similar to Sun Microsystems approach, Robotron need to be the general purpose modular robot. Only by being the underlying backbone system to all competitive robotics needs will volume production be possible to reduce costs. Also by defining Robotron as the industry standard for humanoid and modular robotics in the early stages of modular robot technology, it will ensure a dominant industry position when modular robots become commonplace. As modular robots transition from purely academic and experimental phases, it will become increasingly important to maintain an established market segment. In both the Early Adopters market and Mainstream market, the challenges also lie in the advancement of consumer electronics and their increasing market creep into new demographics. This was facilitated by the continuing decline of prices for music players, digital cameras, and hand held video game systems. In the past 10 years, toy sales growth in North America has remained very flat, whereas video game and computer game sales have continued to rise at alarming rates. Not only are those two market segments overtaking toy market shares, but they are moving downstream to younger and younger customers. The result is a market very accustomed to being offered high technology products at moderate prices for all age groups. The demand from the customers is very refined products that offer a lot of entertainment value. From the early adaptors market, we need to cross The Chasm into the reality of the mainstream market. The product plan here differs slightly from the early adopters. The early adopters will receive a product that remains much more adaptable and customizable. They will be offered a platform to launch their ideas and focus their creativity into a set of modular robots that will perform a task they or others have designated. This differs wildly from the mainstream market. Such freedom to create a tangible product will result in failure. Mainstream users would not be as creative or technically endowed to functionally incorporate individual modules into clusters and find entertainment value. The promise here is to introduce this technology to consumers at a very young age. The strategy is to target customers that have not yet latched onto consumer electronics like iPod and cellular phones as exclusive forms of technological entertainment. The mainstream market is a much broader market that focuses less on high technology as much as on entertainment values. Above and beyond all, our product is a toy that children and adults will buy. The initial market would be children between the ages of seven and twelve. They are the best mainstream market because they are able to adapt and utilize new technology rapidly. The mainstream market is much more fickle than the early adopters. After the initial years of Robotron they will be demanding something newer and more revolutionary. One of the examples we used as a role model was the AIBO robotic dog. This really was a revolutionary product when first introduced in 1999 by Sony. Its suite of sensors allowed it to interact with its environment and its prerecorded reactions to specific stimulus made it seem “alive”. The marketing model analyzed showed that AIBO dominated the toy market for several years, but was unable to evolve beyond the concept of a toy. It eventually fell prey to video games and other one-shot-wonder toys. This mindset of a limited production run of the toy like Stage 1 was applied to Robotron, hence the divergence of a triple-tiered production plan. The purpose of the triple tiered production program was to maintain focus on the core technology that initially developed the product. The real success will be to launch the Stage II Robotron into a field where it will transcend the level of toy. The key would be to create a “market” by hosting and sponsoring robotics competitions. This has a two-fold advantage: it will offer an outlet for creativity that can be harnessed in future robotics inventions and will create an arena for Robotron products. This requires the foundation laid by early adopters in existing robotics competitions. Eventually, robotics competitions will be promoted very much like championship boxing matches, pitting teams of engineers and hobbyists against each other. But the market will not be exclusively tech savvy men. Instead, the key to modular robotics’ survival is to encroach on the video game market. The video game market has taken a commanding segment of children and young to middle age adults. The allure is the reflection of real life meshed with the endless possibilities offered in the video game virtual reality. Reflection of reality can be seen in sports games and racing and flight simulators, where as the fantastical limitless virtual reality can be observed in cult favorites like World of Warcraft. World of Warcraft has provided an outlet of creativity that is unmatched in the world, where players become immersed in the lore of mythical creatures and have no clear definition of winning or losing: the focus is on the experience by playing. Robotron can break this spell of virtual reality by creating a complementary alter-reality with avatars coming to life in three-dimensional, modular, humanoid robots. Be evolving side-by-side with video games, action figures will no longer be beholden to a single movie franchise. It will be so simple to customize a Robotron to become a specific character from a specific movie or video game, Robotron would create a secondary market of creating costumes and specialized modules that will reflect this expansion into the toy industry. This will be how the toy industry is revolutionized. The sale of action figures and motorized vehicles has been extremely flat, if not negative in trend. The video game market has only gotten larger and larger, growing at a rate traditional toys have never fathomed, over a period of time much beyond a singular product. It is time to acknowledge and adapt to this trend. Although this appears to detract from the early adopter’s strategy, the mainstream market has a very different segment than those of the early adopters. The early adopters would be counted on to make the necessary refinements to the system such that Robotron would become a much more complete product upon introduction to the general public. Referring back to the Product Development Funnel, the early adopters will react to the prototype and that feedback will help generate a product that can be launched to the masses. The pricing strategy for this product will be to undercut existing modular robots by reaping the benefits of technology advancements made in the early adopters’ stage. By branding Robotron as the standard of the tech world, the high volume demand will push costs down. Pricing can be seen in Appendix 5. Pricing from similar modular robots like Bioloid range from $339.00 to $2,999.00. Robotron is a bargain compared to these exorbitant prices. Also, separate modules and sensors would be available to consumers to further customize Robotron. Marketing and sales tactics will be a progression of the robot competitions, initially relying on a viral campaign to attract video gamers. Beyond the initial launch of Robotron, television commercials paired with a Saturday morning cartoon spin off would continue to fuel demand for Robotron. Some of the major risk factors actually revolve around United States technology culture, specifically in robotics. Robotics research in the United States focuses heavily on industrial development, and less on social or consumer applications. This is very different than in Europe, Japan, and Korea, where there is a lot of interest in interacting robotics and artificial intelligence. This creates a consumer base disconnected with the advancements of robotics research. This information gap rolls up several short coming in U.S. infrastructure that would dampen the commercial viability of products like Robotron and Bioloid. This culture difference accounts for the lack of investment in the non-industrial robotics industry. The perception that the consumer robotics market is unrealistic prevents venture capitalists from investing in novel ideas in the industry. The primary risk for Robotron is the lack of support from the general robotics community. Several of the competitors examined have been around for a long time. AIBO was first introduced in 1999, but was unable to hold on without a re-invention. Other than a toy, there really isn’t a distribution system in place other than e-commerce type transactions. These are risks that are good for Robotron, because if a competitor was already established, there would be little of a market segment left. Robotron is in a unique position to burst onto the modular, programmable robotics scene. The industry has been softened up by Bioloid and products like the AIBO, but it is far from ripe. However, data projections up to 2014 indicate we are right on the cusp of a robotics explosion. With the strategy outlined above, Robotron has a strong future ahead. The lower price than its competitors should offer a market advantage, as well as the push in competitive robotics. This will push Robotron to be continuously developed and upgraded just to meet the challenges. It is key to maintain focus on exceeding expectations at every competition. They are the key to generating a reputation of innovation and reliability. The video game segment remains a top performer, and to ensure long term continued growth, Robotron needs to ally themselves with the superior product. Only by doing so will Robotron dodge the fate of AIBO and Tickle-Me-Elmo, fading into the memories of Holiday Seasons past.